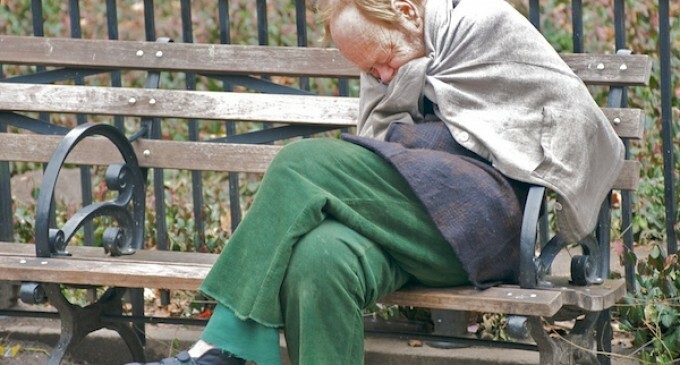 Homeless people in Pensacola, Florida may soon have their blankets stripped from them as a new ordinance makes it illegal for them to use blankets in public. This new ordinance passed despite public outcry. As the homeless would surely welcome a warm place to sleep and hot meal provided in jail, and considering the number of homeless people that will be violating the law coupled with the fact that they can’t defend themselves anyway, I expect that local police will probably just take the blankets. Living in Florida, we don’t often have the opportunity to use the heat setting on our thermostat, but this winter we got the chance in a big way. And as a matter of fact, so many people in my neighborhood were using heaters that it blew out the transformer. This was part of a series of ordinances which prohibited using public restrooms for washing your face, panhandling, and “camping”. Though the mayor’s office and members of the city council tried to say that these ordinances were not targeted at the homeless, email correspondence between them and other city officials proved otherwise. The anti-camping ordinance went the furthest in its limitation of basic civil liberties, making it essentially illegal, not only to cover yourself for any reason, but also effectively making it illegal to be homeless. It was a tough ordinance to fight, because if you opposed them, it gave the impression that you were supporting blight in the city. Not to mention the city council wasn’t interested in having the discussion. The then council president either would cut people off or have them thrown out during the public discussion. The ordinances were passed, in spite of the public outcry. One of the arguments that was constantly used during the limited debate about the ordinances, was that there was a “silent majority” that wanted to see these laws passed. So these people didn’t show up to the meetings or send emails that could be presented as part of the public record. Instead, they might have stopped a council person on the streets, so they claimed it had more weight than the hundreds of folks in the council chambers in protest. I decided to see how true this supposed silent majority was. I started a petition, and within a day we had nearly 1,000 signatures opposing the ordinance. People began to ask the question, “Could this ordinance be used on me, or just the homeless?” And the answer from the legal staff of the city is that yes, this law was applicable to anyone who used a blanket or news paper to cover themselves in public. Even if you got stuck in a city park because it was raining and you tried to shield yourself, you would technically be in violation of this ordinance and subject to arrest. So would your wife and child if they laid down with a blanket at a picnic or festival. The mayor quickly attempted to distance himself from the ordinances, placing blame on the council, even though it has been proven time and again that the memos came directly from his office, at his request. Then the mayor tried to downplay the concern of people saying that there was enough shelter, and that “no one was taking blankets away from the homeless.” But the problem is that the mayor was answering questions no one was asking, directed at accusations no one made. The issue is not that the mayor was taking away people’s blankets, because honestly that would be a violation of the illegal search and seizure clause in the constitution, but rather that someone could be arrested simply for being homeless. The argument that there are shelters open and that they should just go there, showed exactly why the mayor shouldn’t be making policy about things which he doesn’t understand. Not only are there not enough shelter beds for everyone within the city limits, there is not even a shelter within the city limits for them to go to. If someone was to seek shelter, they would have to go into the county and have a valid ID. Not to mention that many folks don’t qualify for shelters for other reasons and many won’t patronize them because they are veterans who suffer from PTSD. The major shelter in town only allows for people to stay three days a month, unless they join their drug rehabilitation and Christian indoctrination program. This is the only solution the city is willing to put forward. No matter if someone ends up on the streets due to bad decision, disability, a poor economy, or if they simply just prefer living outside to dealing with the trappings of the modern life, it should go without saying that they have an absolute right to cover themselves with a blanket. What is the problem in Pensacola? What kind of idiots are you people putting into office. This is not the way of our Lord Jesus Christ. We are suppose to help one another not turn our backs on them. Nothing like kicking a person when they are down,geez! These homeless need protectors. People with guns daring the cops to do something. Pathetic. What kind of soulless scum would let this pass?